In my last post, I described how Ecampus courses use synchronous study sessions to provide listening and speaking practice to students of world languages. Much of the Ecampus language learning experience is entirely asynchronous, however, to provide flexibility for our students. So how exactly do students converse asynchronously? This post will describe the design of asynchronous listening and speaking exercises in 300-level French conversation courses, executed by Ana-Maria M’Enesti, PhD, and facilitated via VoiceThread, a slide show within the LMS that displays course content about which participants comment via text, audio, or video. In these two slides, Ana-Maria intros the topic via video comment, contextualizes the resource via audio, and links out to the resource. The “i” icon indicates an “Instructions” comment and the numbered icons indicate links 1 and 2. VoiceThread was an appealing platform because of the ease with which students can add audio or video comments, more streamlined than the protocol for uploading video to a discussion board, and because of its display of content in sequential slides. When Ana-Maria and I began exploring how to present her asynchronous conversational lessons within VoiceThread, we realized that we could chunk each stage of the activity into these individual slides. This made the cognitive load at each stage manageable, yet provided continuity across the activity, because the slides are contained in a single assignment; students navigate by advancing horizontally from slide to slide. VoiceThread allows each slide to link to external content, so students can maintain their place in the sequence of the assignment while engaging with linked resources in another window. Most importantly, since students encounter all the related learning activities from within a single context, it is clear to them why they are investing time in reading or watching a resource – they anticipate that, at the end of the assignment, they will complete a culminating speaking activity. For the culminating speaking activity, we used VoiceThread to provide each student with a place to upload his or her initial post as a new, individual slide that occupies the entire horizontal pane. Replies from peers are then appended to each student’s initial slide post. Visually, this is easier to follow than a text-based discussion, with its long, vertical display of posts that uses nesting to establish the hierarchy of threaded replies. Within VoiceThread, as students advance through the slides, they are able to focus their attention on each student’s initial post and the associated peer replies, one at a time. A student’s initial slide post displays her individual environmental footprint gained from using the resource linked earlier. On the left, there is an audio explanation and comments between the student, “AC,” instructor, and peers, labeled by their initials or profile pic. Now that I’ve discussed how we exploited the mechanics of VoiceThread, I’ll review the learning design. 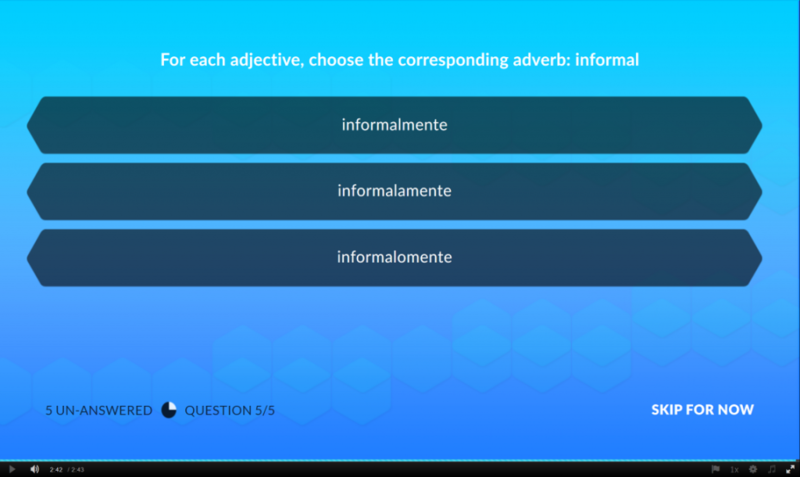 To progressively scaffold students’ conversational skills, Ana-Maria builds each assignment as a series of activities of increasing difficulty. 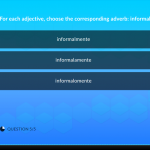 On the first slide, students might be prompted to share opinions or personal experiences of a topic in order to activate prior knowledge of thematic vocabulary and associated grammatical structures. Then, on subsequent slides, students are challenged to read or watch related content that is comprehensible, but a bit beyond their current language competence, the “i+1” level, as Krashen coined it. Afterwards, to ensure they’ve grasped the resource, Ana-Maria typically poses factual comprehension questions and then asks students to re-read or re-watch so that they can grasp any meanings they may have missed on the initial encounter. Finally, students are asked to speak critically on what they read or watched, express a solution to a problem, or place the topic within their own cultural context, using topic-specific vocabulary and associated grammatical structures that they’ve heard or read from the included resources. The instructor is present throughout, mediating the interaction between student and content, since Ana-Maria narrates each slide, reading the instructions aloud and adding additional context. There is also support for listening comprehension, as the most critical instructions are written on each slide. For the feedback stage of the assignment, students learn from each other’s responses, listening and providing replies to at least two peers on two different days of the week. This requirement allows conversations to develop between students and provides the third type of interaction, learner-to-learner, so that the activity sequence facilitates all three of the interactions described by Moore (1989): learner to content, learner to instructor, and learner to learner. VoiceThread is quite a versatile tool and is being piloted for use with many other disciplines at Ecampus. I’m sure you can imagine other ways to adapt it to your own context and content! Many online instructors create video lectures or include existing videos to model new skills and to expose students to new content. But how do you know that your students are engaged? To make video watching an active learning experience, add Kaltura’s interactive quiz feature to your lectures or to YouTube videos. You can access Kaltura’s simple quiz tools from Canvas’s My Media tab, or provide Ecampus with quiz questions and let us build the quizzes for you. 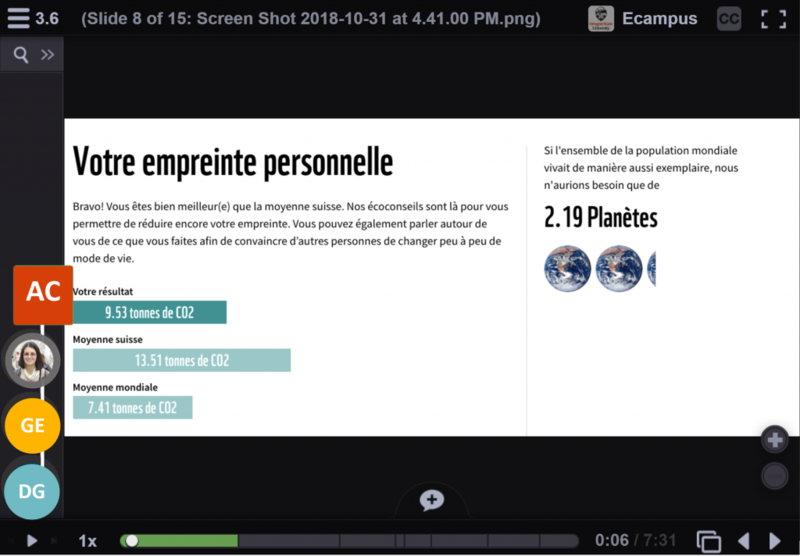 In recent Ecampus courses, world languages faculty have embedded Kaltura interactive video questions at different points in videos to achieve different aims. In Second Year Spanish, grammar lectures conclude with questions that test students’ application of the grammar rules discussed earlier. The placement of questions at the end of the video holds students accountable for watching and understanding the entire lecture. In Introduction to French Literary Studies, interviews with authors are interspersed with questions that confirm students’ listening comprehension of topics directly after each topic is discussed. When students are unable to answer a question, they become aware of gaps in their French language listening skills and can rewatch the segment they misunderstood. Engaging in repeated listening is a critical second language learning strategy that instructors aim to foster in their students (Berne, 1998). Kaltura interactive video quizzes are a simple and fast method that gets the job done. This tool’s usefulness isn’t limited to world languages faculty. Speak with your instructional designer about how to apply this tool to lectures and videos in your own academic discipline. Berne, J. (1998). Examining the Relationship Between L2 Listening Research, Pedagogical Theory, and Practice 1. Foreign Language Annals, 31(2), 169-190. Posted in Resources, Tools & Trends, Videos.